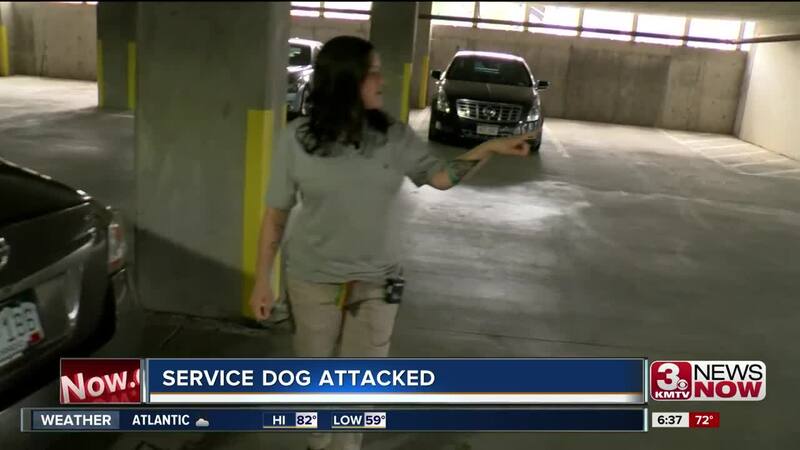 A Denver woman's service animal is undergoing emergency treatment after being attacked inside a parking garage in downtown Omaha. Sharon Johnson said she was traveling across the country with her dog Jasper when they made a stop in Omaha. Johnson was unloading her car in the garage when she says another hotel guest's dog, violently attacked Jasper. "The next thing you know a lady in a red Kia had a dog. They opened the door and it ran out and it was a Rottweiler mix. It started attacking and growling and I had to wrestle the two apart," said Johnson. "When I picked him up, he was gushing with blood." Johnson said the owner left with her dog, leaving behind a trail of blood. She rushed her dog to an emergency vet clinic for treatment. "He has a hole that goes all the way to his lungs from a puncture from a tooth. It's causing him to have trouble breathing," said Johnson. "It's causing him to have air go through his chest versus go into his lungs." Jasper was unexpected to undergo surgery Monday or Tuesday. Johnson says that surgery was pushed back. His medical bills are expected to cost thousands. Jasper helps Johnson who has PTSD. She's hoping the surgery will save his life. A family friend created a GoFundMe to help cover the costs. "He's just sitting there in a little warming blanket and it just makes me cry. He's no idea why is this happening," said Johnson.